Over two days, our family four rode 82km. A week on, and I still like saying that aloud. The Timber Trail had always been a must-do for our family, which spends most weekends out on two wheels, and with summer starting, it seemed like the perfect time to take up the challenge. We set off on our long-awaited adventure mid-week and arrived that night at the Bennett Road car park around 7pm, where Julian from Epic Cycle Adventures greeted us. Julian, along with his father Paul, have recently created a base at the Ongarue end of the trail, and Julian was happy to share his experience of the ride, along with his tips and tricks to getting through our 82km adventure. Epic Cycle Adventures provide a great shuttle service that takes you to enjoy a stay at the Timber Trail Lodge, located halfway along the trail. It’s great for families, and extends two-day cycle tour into a three-day mini break – plus more time spent exploring the beautiful Lodge. When we arrived at the lodge, the managers Willi and Dave welcomed us to our very comfortable lodgings. The lodge is new, and stylishly decorated. I liked their philosophy about sustainability and minimising their impact on the environment. They are conscious of their ‘footprint’ and are working hard to minimise it further with the next step to place solar panels on the roof to gain the advantage of the sun’s energy source. As with most busy families these days, the pleasure of being able to switch off and enjoy relaxing in new surroundings is one to be taken advantage of, so as the children, Meg, 10, and Sam, 12 set off to explore the lodge and the environment outside, Simon and I kicked back with a cold one. The 20-room lodge has plenty of communal space, and we found we were sharing with another group of ladies. We quickly discovered as we joined them for dinner that night they were on their annual get away – five from the Bay of Plenty and one from Auckland. No gossipy shopping trips for this amazing group of ladies, whose ages ranged from 65 to 70, but one where adventure is the glue that keeps them together year-on-year. The next morning we were escorted by by the Pa Harakeke Cultural Group through iwi farmland to the start of the trail at Pureora. The conversation on the way was rich in the history of the area, and in typical Kiwi ‘Do you know so and so from such and such a place?’ fashion, a connection was made. Edwina was our driver and had a great sense of humour and humility. We started off knowing we were embarking on a special adventure in a very special part of the world. In the lead up to the trip, I’d done lots of planning and the Timber Trail has recently launched a new website full of great imagery and information. But as you enter this first part of the trail, nothing can prepare for the ‘other worldliness’ of the surroundings. I took my time to reflect on the months preceding – we’d been out riding as much as possible, but you can never be sure. Having a family adventure was the motivator behind the trip, and we knew we were taking on a big challenge. We came to the conclusion an e-bike for our 10-year-old Meg was going to ensure we all enjoyed ourselves, so a quick call to our friends at Cyclezone in Rotorua meant we could set off knowing we could relax and enjoy everything the Timber Trail has to offer. As we weaved our way through superb podocarp forest, the famous hill climb began. We ended riding with our new friends from the lodge, some who had ridden the trail before, so we got the heads up on the hill. It was a great workout and with several stops along the way (shelter provided), the hill was conquered! We continued to ride at our own pace, stopping when needed, taking in the unique environment which offered every type of terrain. 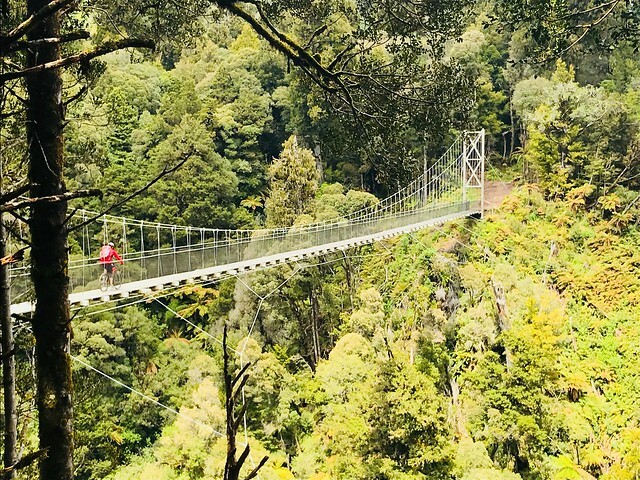 The suspension bridges were a highlight of day one… the first time over can be a bit freaky, but by the end of the trip I was looking down in awe! Reaching the lodge once again at the end of our first day riding, the evening was spent relaxing and reflecting – card games, and quick photo and video editing for fun, then after a sumptuous meal eaten together we retired for the night. Not sure how we would wake up the next day, I was pleasantly surprised when the children woke up rearing to go for day two. Sam and Meg were definitely enjoying the trip, and they really understood how lucky we were as family. I also think the fact a 70-year-old was leading the pack was an inspiration to all! The riding on day two seemed a bit more relaxed, perhaps because we had the first 39km under our belt, and we took it on with renewed energy. The varied terrain throughout didn’t disappoint – the downhill was rocky in places and needed a bit of care, but the magnificent suspension bridges, the history of the tramway and the Ongarue Spiral were highlights. We were lucky enough to see a kaka flying above us as well, which created such a buzz. From the beginning of our adventure to the end, we relished all that this trip offered us. The opportunity to create memories as a family, to undertake a challenge we could all achieve and share with our friends and riding community made it a must-do on the adventure list. The Timber Trail is an easy drive from any part of the North Island, and with the shuttle providers and lodgings available, making it an adventure that awaits all – from 10 to 70 years old. Click here for more details about the Timber Trail.